Thomas S. Clarkson, Julia Ettie (Etta) Crane, Melinda Knowles and Benjamin Raymond, Helen Hosmer, Liberty Knowles, Linda Richards, and George Wing Sisson. These individuals and their families greatly influenced the history of Potsdam. This exhibit is was funded by a grant from the Institute of Museum and Library Services, the Fenner Family, the Friends of the Potsdam Museum and the Village of Potsdam. Click on the link below to go to the Northern New York Library Network's New York Heritage Digital Collections. We have over 500 images on view including: Horse Drawn Transportation, The Automobile in Potsdam, Early History, Churches of Potsdam, Potsdam in the 1940s and Railroad from 1850 to 2000, Potsdam Fire Department, the Burnap Collection of English Pottery and Benjamond Raymonds records of Land Sales 1803 to 1818. Explored the cultural, artistic, and personal significance of tattoos, past and present. The multimedia exhibit included historical and contemporary examples of tattoo flash art and equipment, videos documenting the tattoo process, a photo-documentary project about tattoos and identity, and the work of local tattoo artists. Some local residents of Potsdam submitted photos of their tattoos were included in the show. The image to the left is taken from a collection of tattoo flash art and equipment from the 1920s and 30s donated to the Museum in 1985. The works, by Schofield, will be included in the exhibition. The "Ruth Haley Collection of Postcards". Ruth Haley (1912-2009) was the beloved Guidance Counselor of the Potsdam High School from 1961 to 1979. The postcards that will be featured in this interesting new exhibit were mostly sent to her by her students when they went traveling, and she acquired others when she went traveling herself, and some were sent by family members.. The postcard shown is a rare "circular" postcard sent from Rome, Italy. HISTORIC DOWNTOWN POTSDAM POSTCARDS - is the first of a series of topical postcard displays featuring the Museum’s extensive collection of Potsdam postcards. 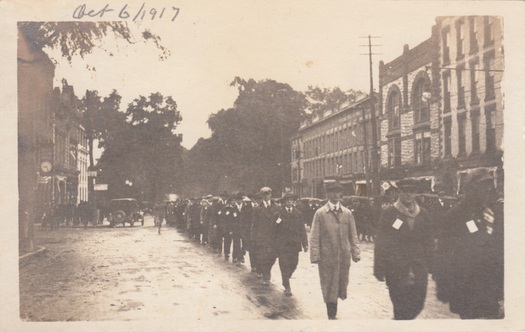 This exhibit features cards from the business area of Potsdam, focusing on Market Street, Main Street, Elm Street, and Water Street. Among the more interesting postcards that are featured in this exhibit are one of Market Street looking north, with a photograph of New York Governor Charles Evans Hughes superimposed, dating to October 20, 1908. 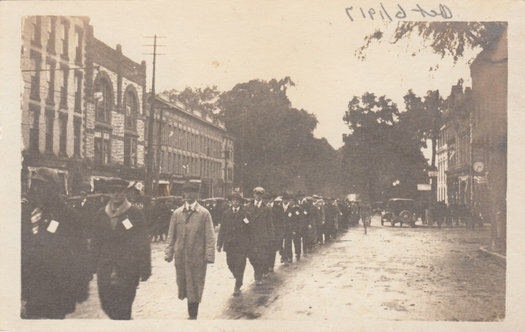 Another fascinating postcard features a World War I parade on Market Street, dating October 6, 1917. 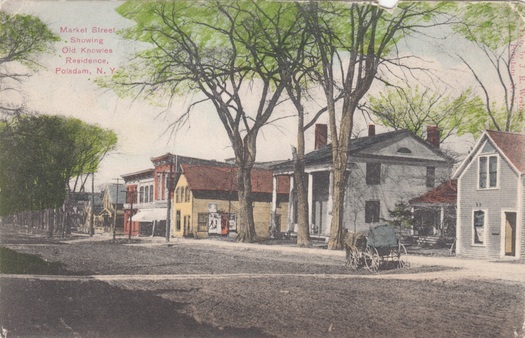 Another intriguing postcard of Market Street looking North depicts the old Knowles Residence, which was torn down in the 1930’s. Other interesting cards depict the Water Street area before Urban Renewal. NOTE: The WW I Postcard (to the right) was originally printed from the reversed negative. Click Here to see our digitally modified / corrected version. The women who wore these dresses left very little to tell us what their lives were like. What dreams did they have? What were their thoughts regarding the rapidly-changing world in which they lived? Through old newspaper articles, souvenir school-books, family scrapbooks, and the internet we have been able to piece together some of their stories. What we have uncovered to date, is documented in this flyer. Includes: Victorian Parlor Display, Nightgowns, Top Hats, Canes, Shoes, Dolls, Teddy Bears, Mercury Glass, Silver, Silouettes, Hair Wreaths, a spectacular 10-foot Christmas Tree, and a life-size Father Christmas. The Potsdam Museum celebrated the 1960s with an exhibit of artifacts, art and music from the 1960s. This coincided with the Mega Reunion of the Potsdam High School which encompasses all classes EVER to graduate from PHS. An exhibition of spinning and weaving tools and equipment from the Potsdam museum's collection, to include: spinning wheels, niddy noddies, yarn winders, scutching boards, hatchels, carders, weasels, and flax breakers. Weaving accoutrements include; looms, warping boards, shuttles, heddles, harnesses and beaters. A blanket loom c. 1800 will be reconstructed on site. Ice wagon with horse, Sam Goldberg, Bill Cornell, Willow St.
Dr. Max Thaler of Parishville making his rounds on foot, c. 1950, he has stops to speak with his neighbor Era Converse on Catherine Street. "Old Betsy No. 2" was a famous steam engine that was used on the Hannawa Falls Power Company Railroad. According to Robert Leete, Black River. Photography teacher, Mrs. Sutter, and museum curator, Mimi Van Deusen, worked together to create a project with students at Potsdam High School's Advance Photography class to utilize the museum archives and the students digital photography skills for a little history and alot of fun for all to explore the changes in Potsdam landscapes. The History of St. Nicholas. Chief Nelson King "ties one on," a parking ticket that is, with a string. Taken on the east side of Market Street across from what is now the Isle of You. Behind the Chief you can what are now, Josie's Pizzaria, The Bagelry, and Maxfield's. This collection of musical instruments represents a passion of one man's life, Charles Lanphere. Born in Lewis Country, NY with a keen interest in music, he built his first violin at age 10. An exhibition of flags, banners and pennants form the collection of the Potsdam Public Museum.